Looking for a foundation that feels just like a second skin? Our answer: the Perfect Teint Foundation. Its feather-light texture is not only oil-free, but also has oil-absorbing properties thanks to its extremely fine powder particles. The result is a subtle matt finish that melts into the skin, leaving the complexion looking even and natural. Farewell, mask-look make-up! The foundation’s trump card is its long-lasting effect, which provides medium to high coverage that can hardly be felt on the skin. 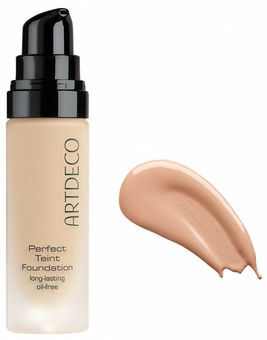 The Perfect Teint Foundation makes light work of camouflaging minor unevenness or imperfections and thanks to its water content, still looks fresh on the skin. What’s more, its ingredients moisturise and nourish, and irritated skin is soothed. Peach blossom extract provides external protection against harmful influences. Let’s face it, it’s the perfect foundation! Pump a couple of drops of foundation onto the back of the hand and use a brush, make-up sponge or the fingers to apply an even layer to the face.